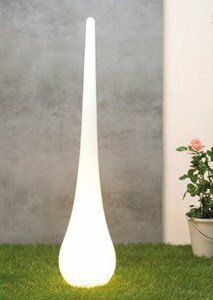 The sculptural floor lamp made of white polyethylene is shaped like an oversized drop. It is the perfect decor to light up the warm summer nights, in your garden.... or the cold winter nights facing a fireplace. And there it rests, motionless, till someone shuves it, swinging from one side to another and then stopping, always returning to its' original spot. Its rounded bottom conceals a seven kg weight, allowing it to turn and returning to its original place. For indoor use, a 2m long transparent cable and a foot dimmer switch is included. For the outdoors a 2m black rubber waterproof cable with earthed plug is included. Recommended light bulb: energy-saving light 23W / E 27 (not included). Stand Up is a lamp designed by Hopf & Wortmann for Authentics.